I enjoyed the process of making the Murra Coat and thanks to all those who followed the journey and especially those who took a moment to comment. 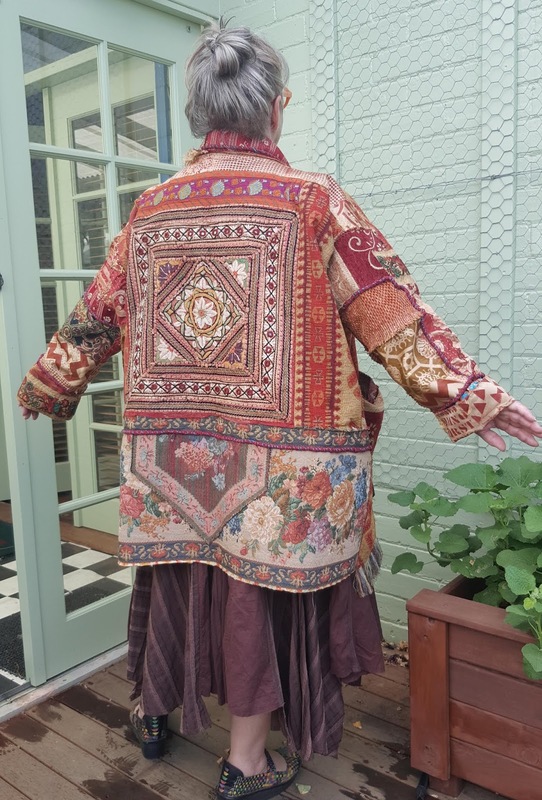 As a textile artist making one of a kind garments is a significant part of my daily practise and if they get sold its an important source of income. If you’re interested in being the proud owner of this piece of art to wear the Murra Coat is listed for sale in my Etsy shop at the moment. For the last few weeks I’ve perservered trying to involve myself in Instagram. It’s always challenging for me to learn new things due to the cognitive weirdness of being autistic, especially exacerbated when it involves being in communities of people. Fortunately communicating on the interwebs means no hugs, air kisses or eye contact, all things I find quite distasteful. However, adding my yammer to Instagram means that is another way you can keep up to date with what I make in the studio and new PDF patterns I publish…If this interests you here is the link to follow me. Yesterday I came across a picture on Instagram of this intriguing dress by the indie pattern company Elbe Textiles. 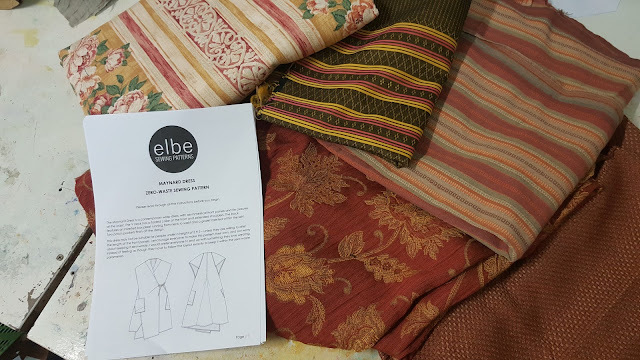 When I looked into it I discovered Elbe is an Australian business located in Perth and the designer is Lauren. The dress I saw is this lovely PDF pattern – the Maynard dress. Not only is the dress beautiful but it’s a zero waste pattern! So straight away I wanted to investigate this ethical and sustainable driven business and was very impressed. The website is beautifully presented and Laurens designs are fabulous. I bought the Maynard dress PDF and embarked on my new project yesterday. Not only did I like the Maynard dress for its aesthetic but being a zero waste garment meant it is made from a rectangle of fabric that it is completely used, without any offcut wastage. 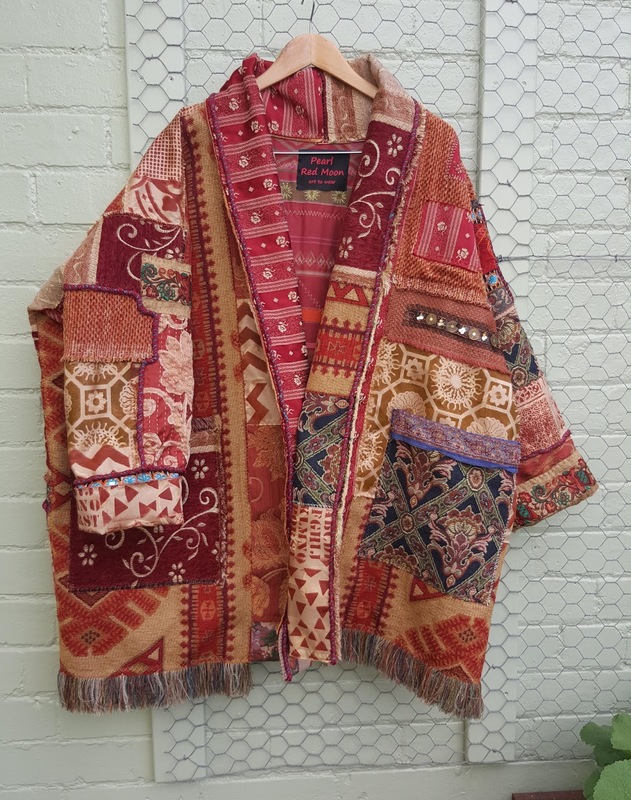 This is a wonderfully sustainable use of fabric and I wanted to investigate how well I could use this concept to use up some of the fabric wastage in my studio. I never throw any fabric out, except for perhaps the smallest shreddy edges and miniscule scraps. Everything that is more than about 10cm square is saved for re use. For my interpretation of this design the intention is to make a rectangle of fabric that is patched together from large offcuts and pieces of scrap fabric. The first stage to make a new garment, for me, is always to rummage around and collect all the textiles I think will combine well together. So this is the pile I gathered on the work table. My favourite and inspiration piece was the stripey cotton table cloth I bought at Scone Vinnies on Tuesday. Its the 3rd piece on the top right. 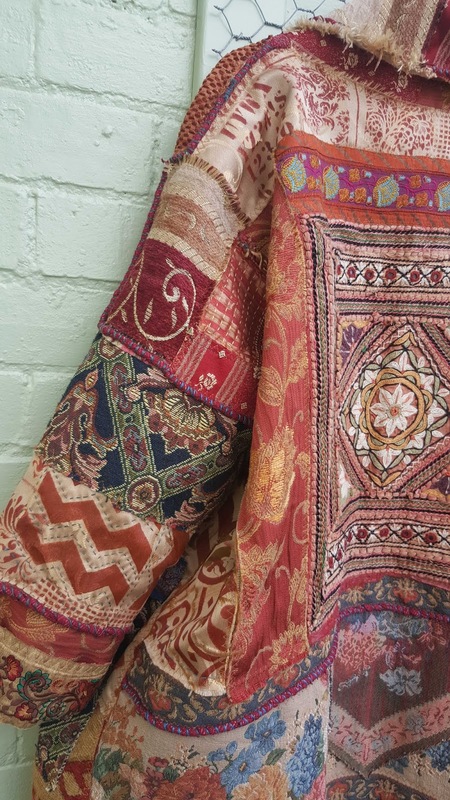 This lovely wash softened, slightly worn and faded piece of fabric measured 120cm x 180cm and cost $2. As soon as I read Lauren didn’t recommend striped or directional fabric for the Maynard design – heh! I knew I wanted to use lots of stripes. I decided to cut mostly thick strips of fabric and overlay them and sew with the wide 3 step zigzag in the method I use a lot. This allows the fabrics to fray a bit on the cut edge. It is also very economical with the use of fabric as there aren’t any seams turned to the inside. I was going to make the largest version of the Maynard dress, size I, which fits Bust 116cm. This was still going to be a size too small for me, I’m an Aus size 20 and my bust is 120cm, but of course, I’m in no way daunted to upsize the garment. I’m also considering perhaps adding a sleeve, but will wait to see how the dress works as a layering piece with a teeshirt or other sleeved top worn underneath before making the decision. To make the dress I needed a rectangle measuring 140 x 216cm. 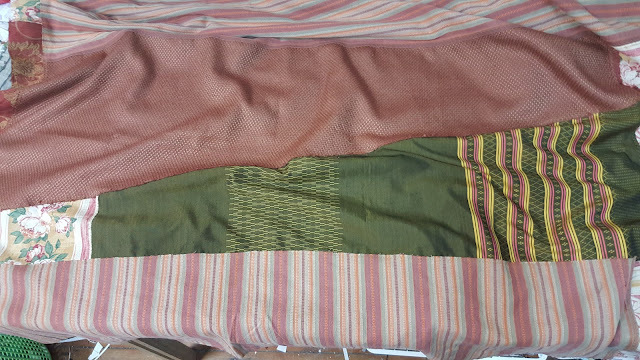 So by the end of my working day yesterday I’d pieced the fabrics shown in the picture below. 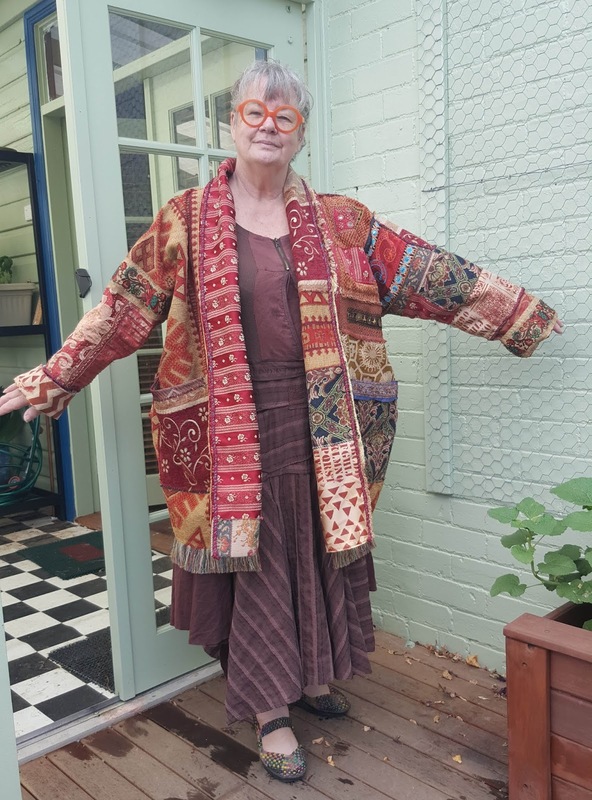 I finished the Murra Coat a couple of days ago and here are the pictures. Adding the front bands makes such a difference. Above is a picture of the bands laid out on my worktable before they were attached to the jacket. They are simply long rectangular strips. I pieced together several pieces of the various fabrics and stencil prints to maintain the patched together consistent look of the coat. As you can see from the picture above the finished length is almost to the knee on me. I'm 165cm(5' 6") tall. 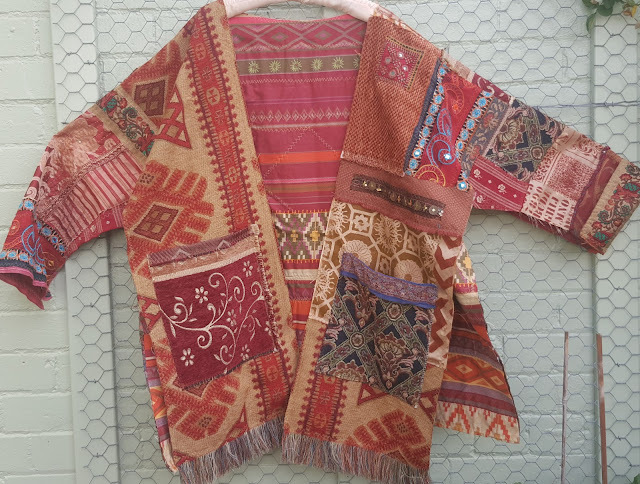 I made the longest length and the largest size XL options of the Wiksten Haori Jacket. When I cut the back of the jacket I was amazed how LARGE it seemed and felt sure it would be way too big for me...However, I was mortified to discover it fits very well on me! How big is my bum! The fit is loose but just right for wearing over layers of clothes underneath. Just a reminder that this coat is made ENTIRELY from thrifted, upcycled fabrics. If I hadn't collected them they would have soon ended up in landfill or in the bags of rags that Vinnies provide to tradespeople (and then into the waste stream soaked with paint, oil or other chemical). Its hard to estimate a very precise cost of the materials that were used. For example I only used 1/3rd of the fabric salvaged from the $6 doona cover used for the coat lining. 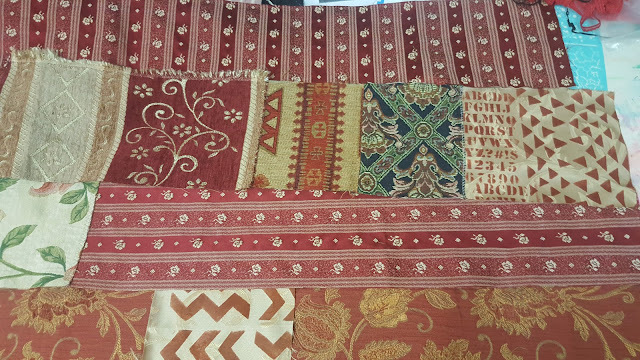 About 2/3rds of the tapestry cotton table runner which is the lower back of the coat was used, the runner cost $2. 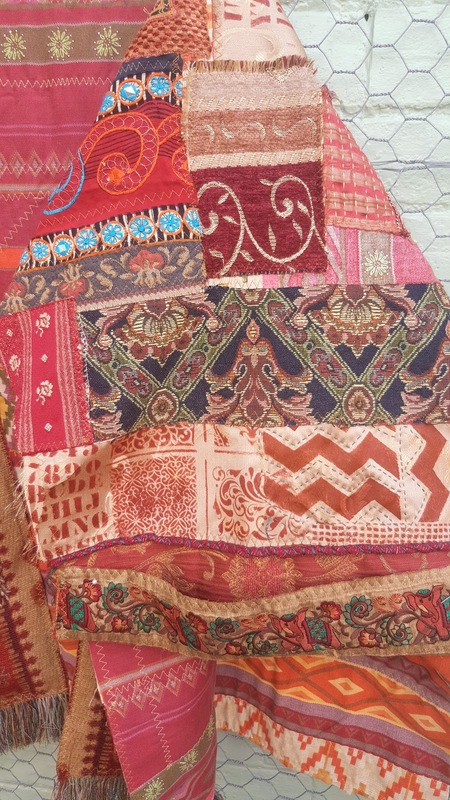 The square embroidered indian cushion cover forming the centre back cost $1. The table runner used for the left side front and in various other places was a set of 2 and only about 3/4 of one runner was used, the set cost a $1. 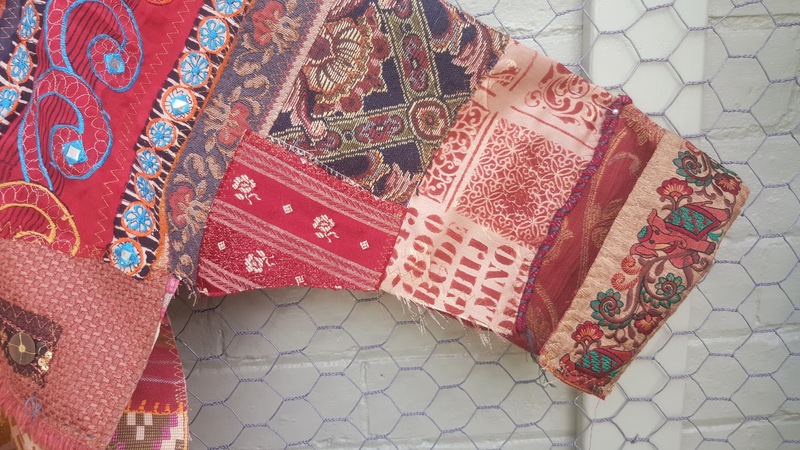 Other pieces of vintage upholstery fabrics were patches cut from a big bundle of 7-8 pieces bought for $5. One of those pieces was more than 2 metres, the total meterage of all the fabrics in the original bundle would have been more than 10. 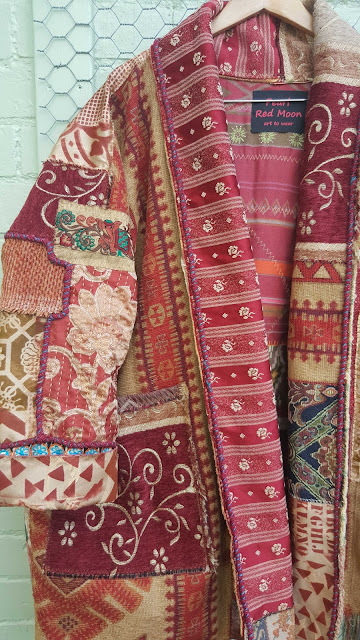 A few months ago I blogged with pictures of one of my Zambeesi Jackets where you can see some of the same fabrics have been used. The best I can estimate the materials used to make this coat would have cost is around $12 - $15. The globalisation of the clothing manufacturing industry affected my work and income in the 1990s. I was a sewing outworker working from home supporting my son and I from that work. As an immigrant from New Zealand I wasn't able to claim any social security benefits from the Australian govt for 10 years so if I wasn't able to work there was no falling back on any hardship pensions from the govt. I emigrated to live in Australia in 1986 with my 6 year old son and worked from home doing sewing outwork with an occasional contract for patternmaking. This work supported us for almost the next decade. Regrettably the 1990s was the beginning of the end of the home sewist contractor. The clothing industry was going global as protectionist regulations that had existed for decades were removed and local manufacturers moved their work overseas where they could employ workers in 3rd world countries for a tiny percentage of what local workers were paid. By the mid 1990s I had to throw my hands up in despair as I could no longer make a living wage. I’d been working 10-12 hours on piecework and only earning $40-50 a day. At one stage I was getting paid $5.50 per dress for a designer dress that was retailing for $195. This dress took 1 ½ hours to sew and each one had to be returned steam pressed and bagged to the factory. It was the end of being my own sweatshop slave as the future for home sewing outwork became unsustainable economically. I was only one of tens of thousands of home based workers and small workshops that had to shutter up as we competed for less and less work. I'm not suggesting you should stop buying clothes at the stores that source their products from overseas. I'm just urging you to cultivate awareness of how your buying power can directly affect the lives of the real people (mostly women) who labour full time with their hands to make an income not sufficient for dignity or their needs. Investigate where the clothes are being made and find out what that stores/companies policies are to support their overseas workers. Make decisions not to buy the products if you feel uncomfortable about the situations of their production. 2) the reason some clothes are "cheap" is due to the workers who actually make them with their hands and sweat only getting a tiny proportion of the making cost. 3) the "real" costs of production have been obscured up until the present day because it has been politically unpalatable to factor in the costs to the environment, such as water, the chemicals applied to keep the soil artificially productive, the costs of mechanisation and the polluting side effects of the fuel used to cultivate and move the product sometimes tens of thousands of miles from its site....The world is in the beginning stages of experiencing what the real cost has been as our climate changes irrevocably. Today I'm getting very close to finishing the upcycled jacket. It needs a name rather than that broad description so it's going to be referred to as the Murra Coat from now on. Here's a picture of where I finished up by the end of yesterday. Saturday, it was a super busy day in the studio with a half dozen visitors stopping by for a chat (hello Yoni! Inga!) so I only ended up doing about 3 hours work on it. As you can see the pockets have been added and the sleeves attached. The side seams will stay open for a while yet as I need to work on it flat. This way it goes under the machine foot plus hand stitched details can be added with ease. Only the bands need be added to the fronts and around the neck. Above are some close ups of one of the sleeves. The cuff is intended to turn back so I sewed a fabulous wide piece of vintage Indian embroidered edging with elephants on the inside of the sleeve. Look closer to notice some more details like the bit of running stitch embellishment in between the zigzag stencil prints and along the bottom of that stenciled piece is a twisted strip cut from a knit teeshirt. That was 2 narrow strips twisted into a thick cord and sewed on with 6 strands of DMC embroidery thread. I'll add a lot more of that particular very textured detail to other areas of the coat before its finished. I'll be showing where things are at with the Murra Coat later on today or tomorrow morning.